As I’ve stayed in many wellness hotels over the past years, my love affair with infinity pools has grown and grown… Although several hotels and SPA resorts boast tempting sky pools, there are only a handful that have managed to design truly over-the-top infinity experiences. 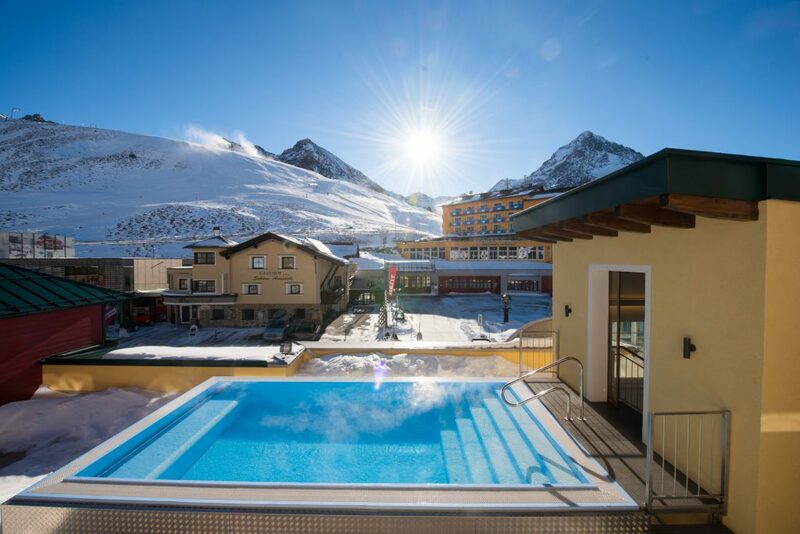 So if you’re planning to swim in a fabulous sky pool, then keep reading and let me introduce you to the 4-star superior Mooshaus Hotel located in Kühtai. This winter resort (open December to April) is located right on the slopes, and features awesome views of the Tyrolean Alps. 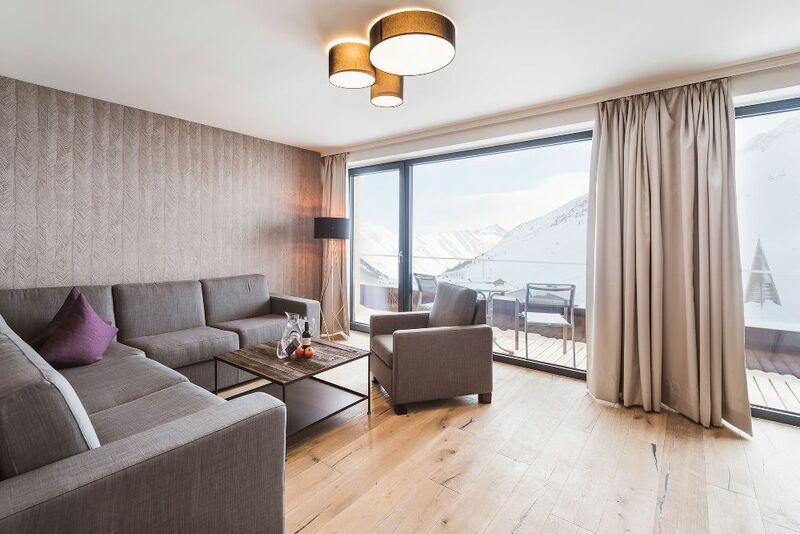 A good ski hotel meets your basic needs, with a location near the slopes. 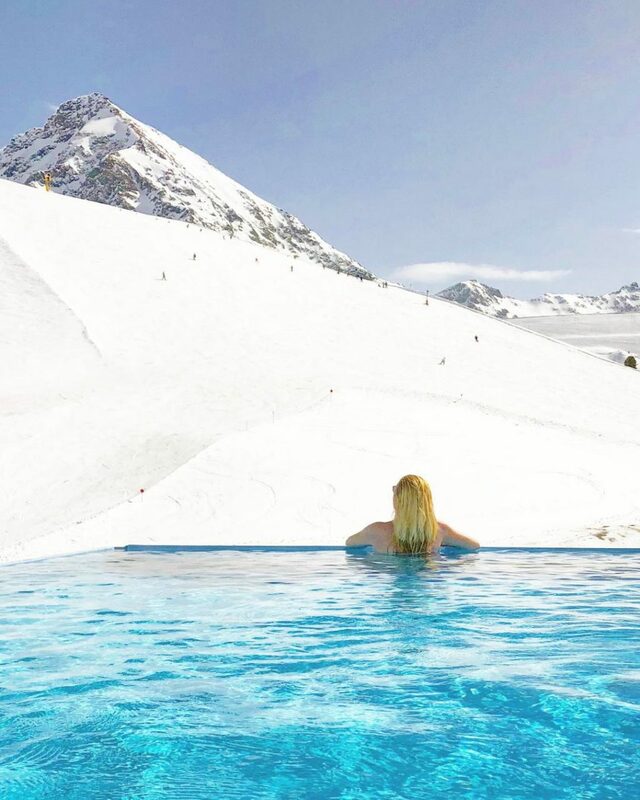 But a great ski hotel, however, elevates the ski experience entirely by featuring a fantastic SKY POOL to unwind after a day on the slopes… Welcome to the highest infinity pool in the Alps situated at a healthy altitude of 2,050 m above sea level! This pool seems to hang out into the heavens itself. The ENDLESS SKY POOL overlooks a gorgeous view of the mountains, and around its edge, the water seems to flow over into the landscape and become lost to infinity. Staring at the insanely stunning mountain range around me. It goes without saying that the majestic beauty of Kühtai can be described only with superlatives. Its beauty is astounding – almost too beautiful to be real. Best part? Twice a week, the sky pool is opened for a night swim – an exquisite, unique water experience that adds a real dash of magic. GOOD TO KNOW: kids must be at least 16 years old to enter the sky pool. But supervised daycare is available in the hotel, meaning your kids (aged 4 +) will be taken care of when you want to indulge in the sky pool – click here to read more about the MOOSClub for kids & teens. 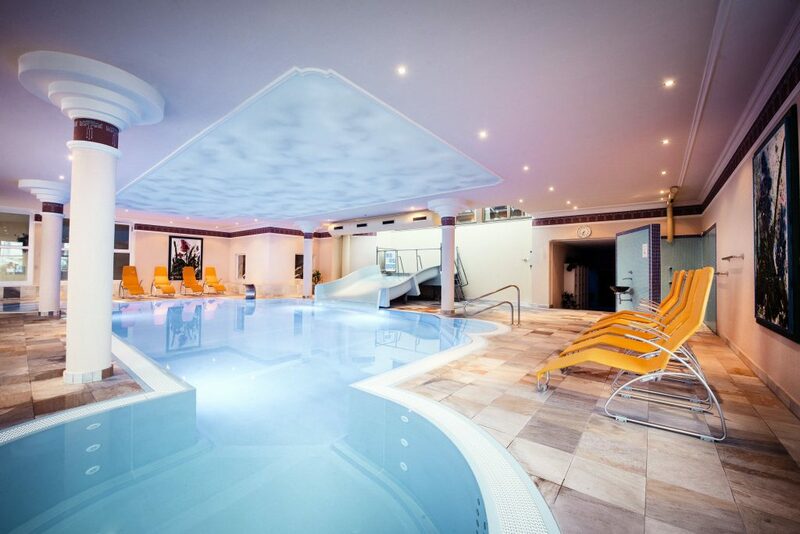 However, there is a Family Indoor Pool featuring a water slide & waterfall, and a whirlpool with massage jets. And there’s a Baby Pool… Your kids will definitely love it! 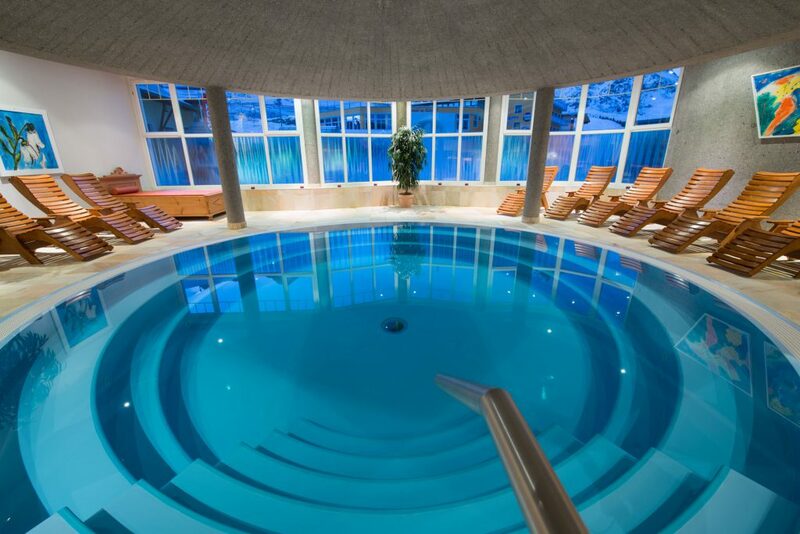 Last but not least, there is the panoramic Moosbad Pool located on the 1st floor, and the Crystal Bath – a calm, circular pool providing a truly relaxing ambiance. Please note that kids under the age of 14 are not permitted to enter these pools. Tranquility is guaranteed! To sum it up: the Mooshaus Spa & Wellness area boasts five pools, relaxation and play areas, various saunas, and beauty & health treatments. After all, what is there exactly to do in the spa? 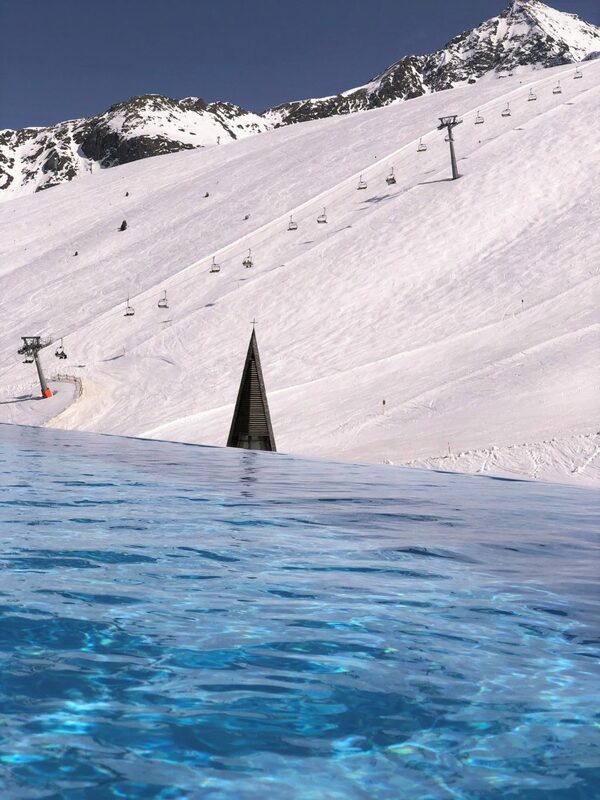 Relaxing and relieving stress by floating in these wonderful pools. 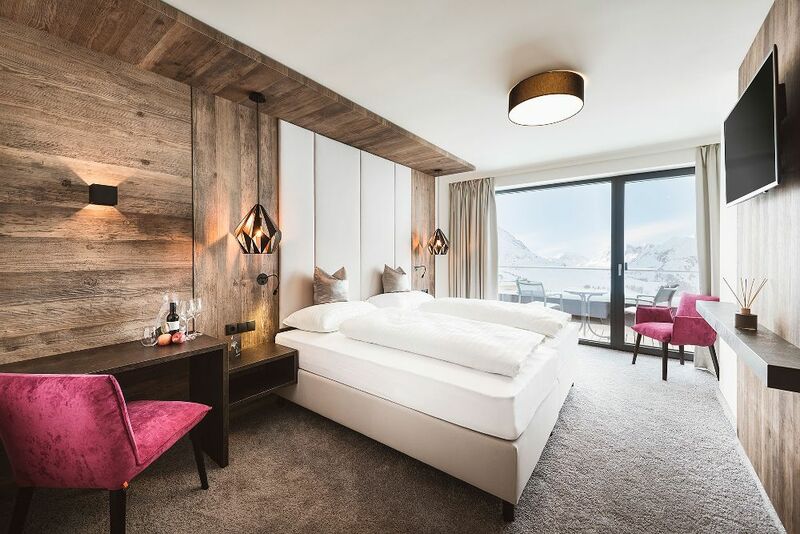 Mooshaus features a traditional Tyrolean style building plus a new modern one – so be sure to book a room, apartment or suite in the new part of the hotel because the large windows take in sensational snowy panoramas. You won’t want to miss this! Fancy a SUITE? 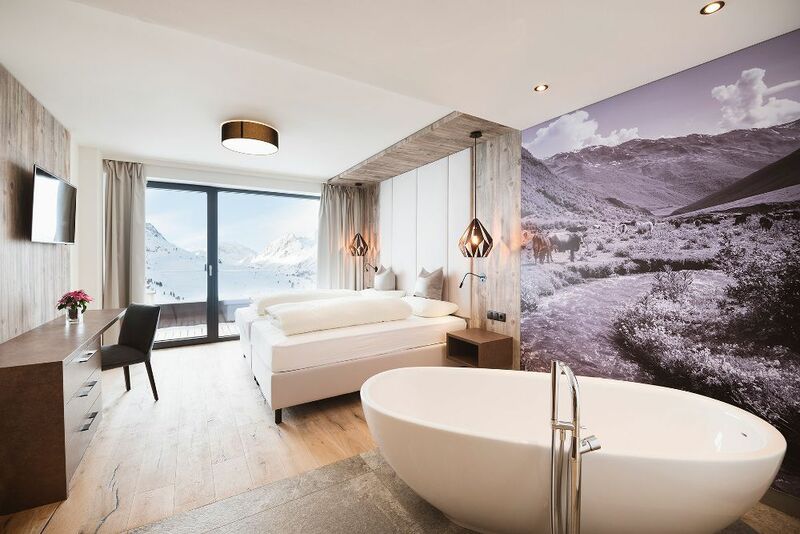 With beautiful views of the mountains from your balcony, and modern in-room bath tubs, you barely need to venture out of your room. There is an expansive breakfast buffet to choose from and hot dishes are made to order. Moreover, scrambled eggs and bacon accompany cheeses, cold meats and pastries. 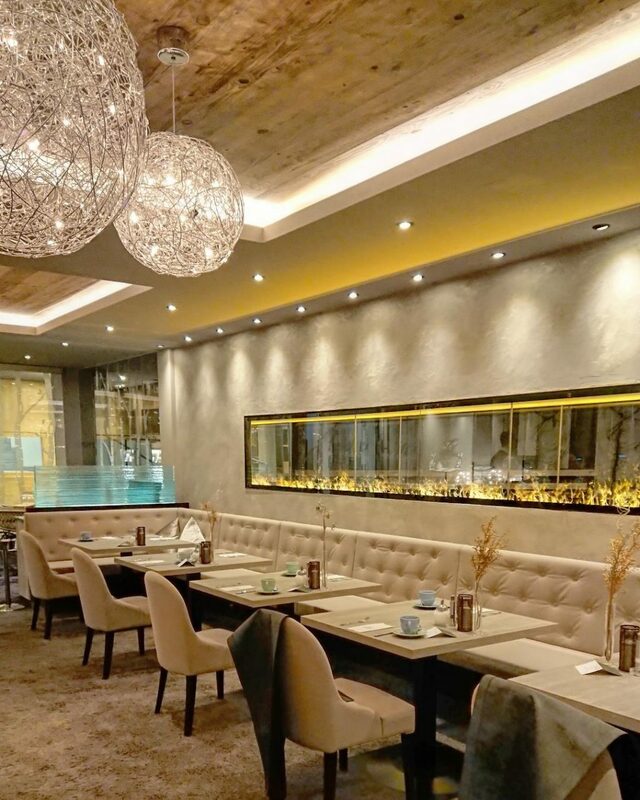 In the evening, you can indulge in a carefully composed 6-course menu of your choice that combines traditional Tyrolean meals with a range of international dishes. In short, the menu is adventurous and extensive, and the main restaurant is a place with soul and atmosphere where one can enjoy the good things of life. Besides, Mooshaus serves also a Kids’ Menu. 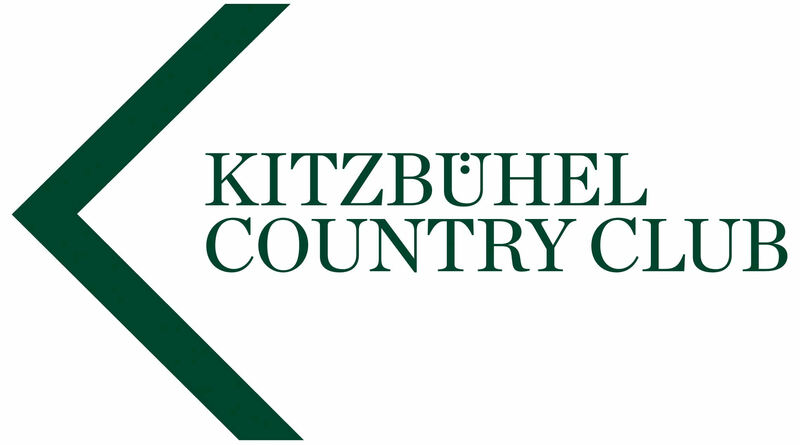 Kühtai features over 80 km of ski slopes, a Funpark for snowboard and free-ski fans (KPark), a well-appointed KidsPark, around 11 km of cross-country ski runs, and a challenging 2.5 km long sled run. But hitting the slopes, whilst trying to look on trend for the season can be a hard job… don’t settle for last season’s ski gear! The GERBER SPORTS– ski shop & school is located right on the ground floor of the hotel, and you can find top fashion labels, the latest equipment for skiing, snowboarding, and a five-star ski rental service. 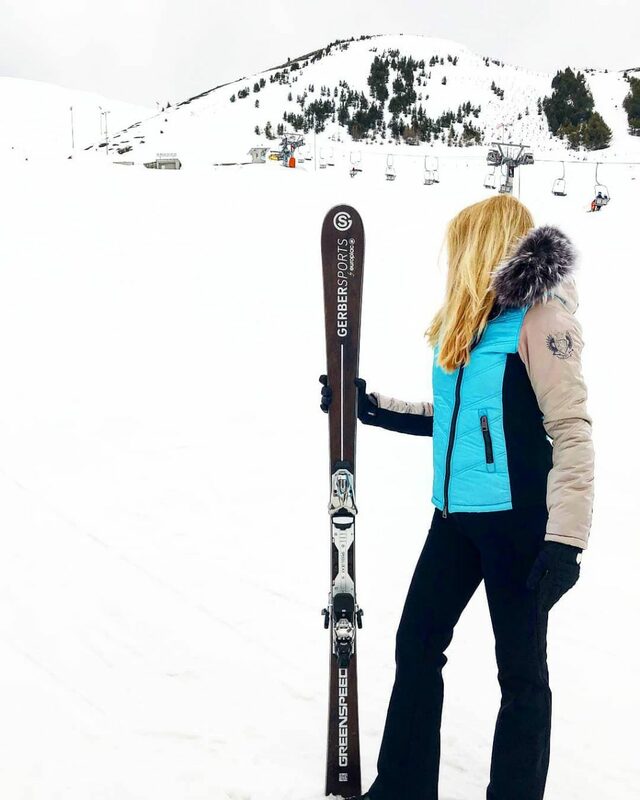 Hitting the slopes in style with GERBER SPORTS! These SKIS are wings! 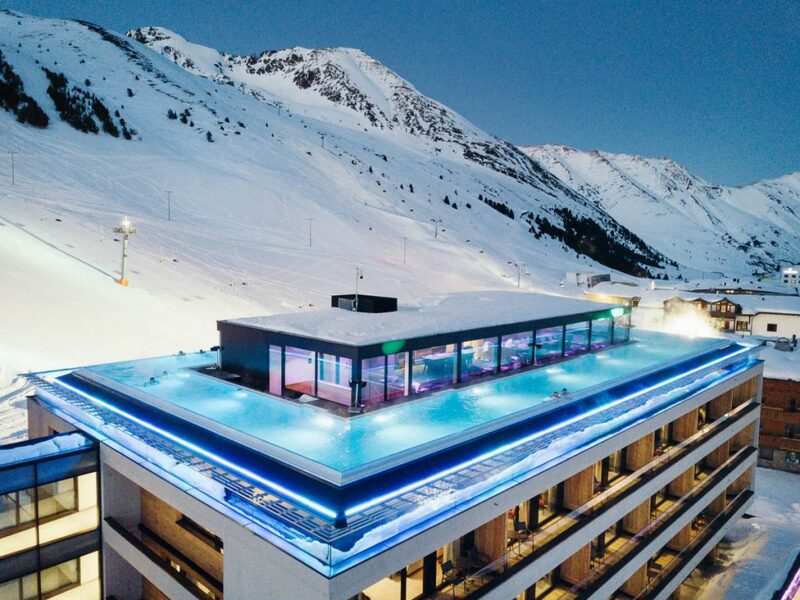 BOTTOM LINE: with the incredible sky pool, awesome mountain views, and beautiful interiors, the Mooshaus Hotel offers a level of luxury lifestyle that goes far beyond the skiing itself. 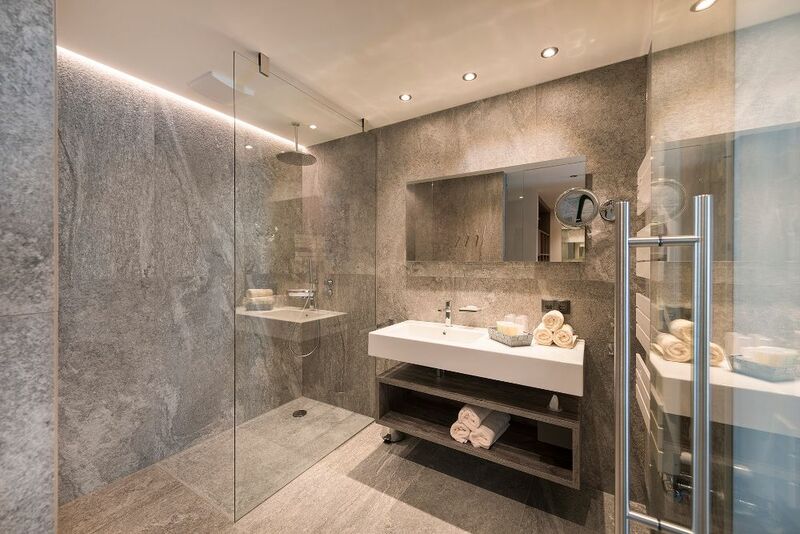 So if you are looking for a family-run hotel that radiates genuine charm without sacrificing the amenities of a sophisticated resort hotel, this one is a winner! Thank you to GERBER family for such an incredible stay, I would return in a heart beat! Opinions are, as always, my own.